What do you do when your phone gets wet? If your phone has fallen into any type of water, you CAN save it. Here is what to do when your phone falls into the toilet, the sink, the bathtub, or gets left in the rain. You must move quickly. THE KEY HERE IS TO REMOVE THE PHONE FROM THE WATER AS FAST AS YOU POSSIBLY CAN. The longer your phone is in water, the worse it can be. Here is how to do everything possible to save your precious phone from water damage. The longer your phone sits in water, the more likely water will get inside the phone and destroy it. Remove the phone from water as fast as possible and you have a chance to save it. When you get your phone out of water, if it is still turned ON, TURN IT OFF ASAP. If you keep your phone on when it is wet it will short the internal circuits and destroy it forever. Remove the case on your phone if it has one. Dry and clean the phone. If your have an Android then you can remove the back cover, remove the battery, remove the sim card, and remove the SD card. If you have an iPhone, remove the case if you have one and wipe it down to clean off any water. Now let the phone air out. Your phone may be dry on the exterior, but the inside may have water in it still. To be sure the water is PULLED out of the inside of your phone use rice or a silica product. Get a large empty dry bowl and fill it with uncooked rice. Use a large amount of rice. Put your phone into the rice bowl and and cover it with rice until you cannot see your phone. Bury it deep. The uncooked rice will PULL away moisture that may be in your phone. This trick makes it so the inside of your phone is completely dry. If you do not have rice, you can use those tiny silica packs that you find in things like medicine bottles, shoe boxes, and the small packets you find in electronic items for shipping. Use a large plastic bag and put the silica packets inside with your phone. The silica packets remove water and any type of moisture and can be a perfect solution to removing water and moisture from your phone. Leave your phone either in the rice or in the bag with the silica packets for around 48 to 72 hours. This will ensure the moisture is removed from inside your phone. NOTE: Another good thing to know for removing the water from your phone is to keep the air moving over it. Putting your phone in a bowl or in a bag will slow down the movement of air and will take much longer to dry your phone. So use and try a few different methods. Try the rice method and silica method but also try to get some airflow over the phone at the same time to assist with PULLING the moisture away. 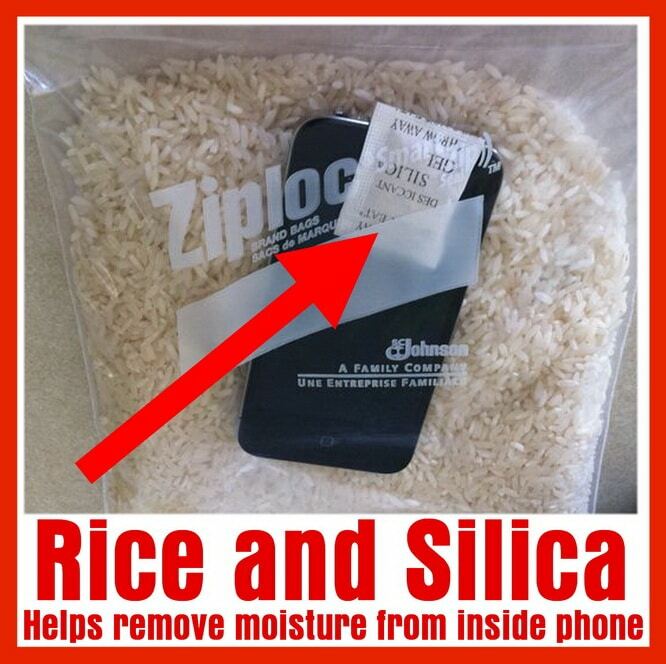 Take the phone out of the rice or silica packets and remove any dust that may be present on your phone. Charge it if needed. If you see that the phone is charging, this is a GOOD SIGN! Let the phone charge until it has enough battery charge to turn on. Turn your phone ON. Does the phone power on and work properly? If not the phone is internally broken. If it powers ON, then the phone is clear of moisture and it is fixed. If the steps above did not work for you, try cleaning it out to remove any dried particles (possibly salt from salt water or chlorine from a swimming pool) that may be stuck on the circuit board or elsewhere. Disassemble your phone with the proper tools. Remove everything until you see the circuit board. Use rubbing alcohol with a small brush and LIGHTLY brush the circuit board. Be careful not to rub certain parts of the board as the rubbing alcohol may remove types of adhesives that connect the board to the phone. The alcohol scrub should stop the chemically reactive process started by the water that slowly breaks down the components on the phone’s circuit board. Once you have cleaned it out with rubbing alcohol, let it dry out for a few hours. Put the phone back together and see if it powers ON. If not, it is time to buy a new phone. You can recycle your phone or possibly trade it in to get a new one. 1. If your phone gets wet what is the best way to fix it? See the other items you can use to dry out your phone below. 2. Is rice the best product for drying out your phone? Yes but there are other household products you can use. 3. Will my phone ever work again after getting wet? If you use the methods above, you have a good chance of your phone working again. What else can you use to dry out a wet phone? If you know of other ways methods for what to do when your phone gets wet, please leave a comment below so we can share with our other readers. Previous post: Will A Queen Size Mattress Fit On A Full Size Bed Frame?